Mayor Gareth Eales, Labour's parliamentary candidate for Northampton South, was addressing a crowd of around 80 people at an anti-cuts rally organised by Save Northants Services, as Northamptonshire County Council prepares to make a decision on next year's budget this Thursday. Also speaking at the rally outside All Saints Church were author Alan Moore, journalist and filmmaker Peter Stefanovic, chief executive of Northamptonshire Rights and Equality Council (NREC) and Defend the NHS campaigner Dave Green. “This is an authority that has spent £50m on a monstrosity of a building, NCC staff were an afterthought in that process," said Mr Eales. He added: “They said everything was under control… that was a disingenuous statement. “They are financially and morally bankrupt. “They have put lives at risk and it is the most vulnerable that will suffer. “The people of Northamptonshire have been the victims of political fraud. Northampton's Alan Moore, author of The Watchmen and V for Vendetta, gave a history lesson on Northampton's troublemaking past. "Northampton, historically, is really, really good at producing one thing… and that’s not Batman comics, that is not even shoes - although we do make some really good shoes - what Northampton is best at producing is troublemakers. Campaigner and social commentator Peter Stefanovic criticised the Government for allowing four million children to live in poverty. He said GPs were prescribing nutritional drinks to children and sending them to foodbanks because they were not eating enough. "We are seeing levels of poverty not seen since the Victorian age. If we stand together, if we fight to protect the rights of each other, I know justice will prevail and this insanity will end," he said. A government inspection of the county council is currently being carried as a result of the financial concerns at the authority. Should it be deemed necessary, Government commissioners may be appointed to take over aspects of the council in order to resolve the problems. Defend the NHS campaigner Dave Green said he was against that idea. “We do not need the Government commissioners. It was the Government who caused this crisis in the first place," he said. 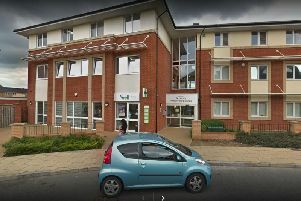 A Northamptonshire County Council spokesman said: “We have faced unprecedented demand for local services for a number of years, coupled with reducing levels of funding from central Government. “In response to these severe financial pressures, we have identified a total of £285 million of savings since 2013 through collaborative working with partners and finding efficiencies and innovation in the way we work. We also put in place spending controls to ensure we are making the most of our resources. “In order to meet the ongoing demand pressures, we are working hard to set an accurate and realistic budget for 2018/19. “Furthermore, the government has allowed councils to use money from the sale of assets to help transform services and now that the county council’s new headquarters is open it provides a capital asset – receipts from which can be used to fund the transformation of services. Under a sale and leaseback arrangement the office complex – which is already saving £53,000 a week on reduced running costs alone - would be sold as freehold with the council leasing it back for a period of 25 years or more.